Beware: The Devil’s Bar Crawl is Back! Do you think you can handle Philadelphia’s Halloween bar crawl? 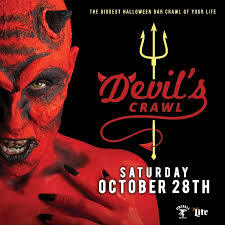 Creep along the streets of Philadelphia on The Devil’s Crawl Saturday, October 28th, 2017 from 8pm – 2am. with proof of wristband? Don’t forget to dress-to-impress because there will be multiple costume contests throughout the night! Stop by Milkboy, Misconduct Tavern, Old City Beer Garden, and New Deck Tavern to name a few. The Devil’s Crawl is known to sell out, so buy your tickets now! For a list of all participating locations, visit http://www.devilscrawl.com/philadelphia. If you’re from the Philadelphia area, the name Joel Embiid should ring a bell. Misconduct Tavern is excited to kick off the 2017-2018 76ers season with a unique beer tributed to the team’s center player. In collaboration with Conshohocken Brewery, this featured beer named “Hinkie’s Sweet Revenge” is a Belgian Witbier brewed with ginger and black currants. This beer will only be available at Misconduct Tavern and Conshohocken Brew Pubs throughout the Sixers season. 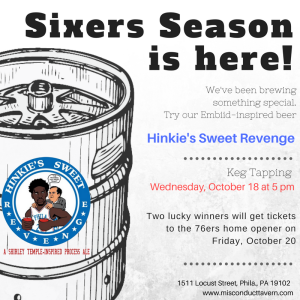 Hinkie’s Sweet Revenge will debut at Misconduct Tavern’s 76ers season opening tip party on Wednesday, October 18 starting at 5 p.m. at 1511 Locust. Guests will have the opportunity to be entered in a raffle for two sets of two tickets to the home opener game on Friday, October 20, 2017 at Wells Fargo Center. Hinkie’s Sweet Revenge will be available at both Misconduct Tavern locations. Misconduct Tavern is located at 1511 Locust St., and 1801 JFK Blvd. in Philadelphia, Pennsylvania. To make reservations, call 215.732.5797 (Rittenhouse Square) or 267.928.4297 (Logan Square). Misconduct Tavern is open seven days a week, 11:30 a.m. to 2 a.m. You can find them on Facebook and Instagram, @MisconductTavern. Breakfast just got a little tastier – with Hummusology’s new brunch menu! This special deal is the perfect meal to share with friends! Hummus, a traditional Israeli dish, is commonly enjoyed at every meal, yes, even first thing in the morning. For only $27, this meal for two evokes the feeling of a morning in Tel Aviv with a sampling of some of Hummusology’s most popular dishes. 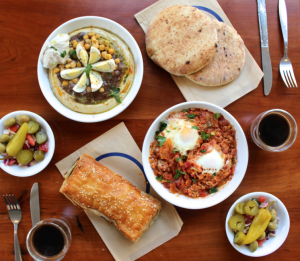 This healthy approach to brunch includes one hearty shakshuka, (two eggs poached in a sauce of tomatoes), one mouth-watering cheese or potato bureka (flaky dough filled pastry), and your choice of one of Hummusology’s signature hummus dishes: Super Classico, Vegetables Rave, Go Hard or Go Home, or the Shroomed Hummus. Those who choose to take part in this awesome deal will also enjoy two pitas, two side Israeli salads with pickles, and two cups of authentic, decadent Turkish coffee. Hummsology’s brunch menu is available from 10:30 am to 3 pm every Saturday and Sunday. And don’t forget to join Hummusology’s loyalty program – every 10 purchases gets you $10 off your next order! Hummusology is located at 1112 Locust St. and is open seven days a week, 10:30 a.m. to 9 p.m. You can find them on Facebook and Instagram, @hummusologyphiladelphia. 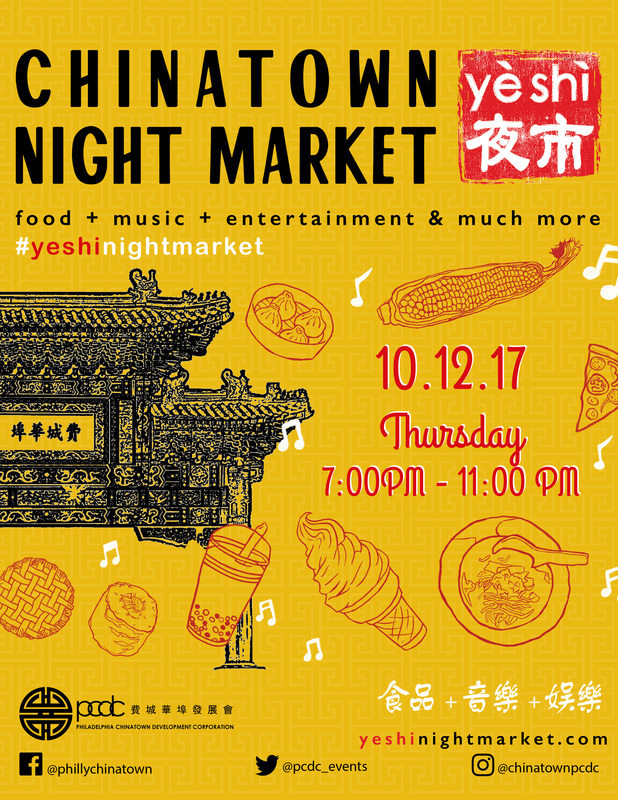 Chinatown Night Market “Yè Shì” Returns to Philadelphia! The Philadelphia Chinatown Development Corporation will host the seventh Chinatown night market event on Thursday October 12, 2017 7-11 PM to celebrate the Asian food heritage and Chinatown neighborhood. In addition to local restaurants and businesses, over 60 vendors are expected to participate. The event is being hosted by PCDC, re-branded as “Yè Shì,” which are traditional nighttime street festivals in Asia. Not only will guests enjoy sampling from food and alcohol vendors, but they can also enjoy music and traditional Chinese dance performances, as well as acts by local talents. Yè Shì also gives guests the opportunity to participate in arts and crafts at 10th and Vine streets. For a list of the 2017 food vendors, please go to http://yeshinightmarket.com/food. This year’s supporters include AARP, AARP: Fraud Watch, Green Mountain Energy, Inspire, Breslow Partners, DJ Ronnie D, Keystone Fire Protection Company, and local community members. 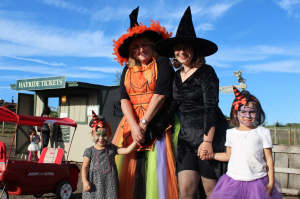 Take a hayride to visit the Friendly Witch’s house at Linvilla Orchards now until October 30, 2017! She hands out treats to the children who stop by, and she is full of funny stories and jokes! There will be a campfire after the hayride where guests will be welcome to roast marshmallows and sample apple cider. Tickets are $9 per person. There will also be fun fall activities happening around the farm, including our pick-your-own apples, straw bale and cornfield mazes, apple slingshot, and pumpkin ring toss. Don’t forget to visit Pumpkinland to find your perfect pumpkin, featuring pumpkins of all shapes and sizes. Please visit www.linvilla.com for more information.